Cover the pineapple slices in brown sugar. Place on hot grill for 2 minutes on each side. Remove and cover. Brush the mushrooms lightly with olive oil. Add salt and pepper to taste. In small bowl, mix Worcestershire Sauce and Grandma Maud's Southern Seasoning and place to the side. Grill the bottom side of the mushroom for 3 minutes. Turn over the mushrooms (top side down) and liberally brush with sauce/seasoning mix. Grill for another 3 minutes or until tender. While waiting, put a little oil on one side of the Pita Bread and grill. 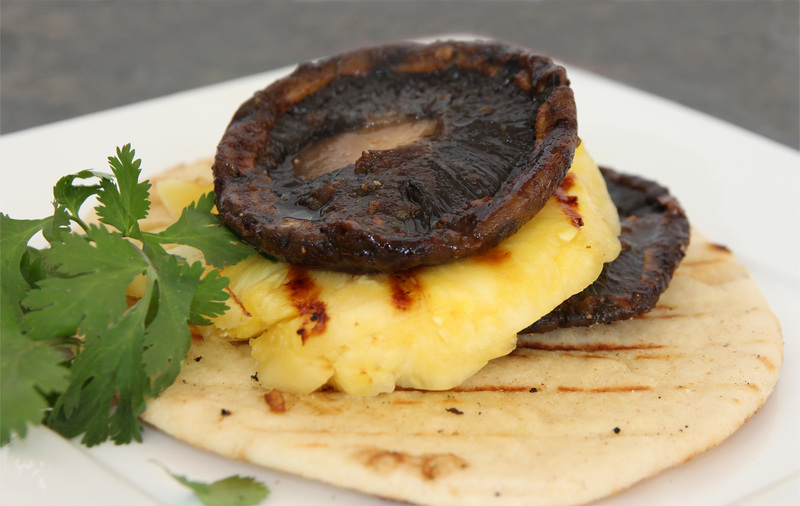 To plate, use a spatula to lift one mushroom and place on top of the grilled side of the bread. Place a pineapple slice on top of the mushroom and serve. Prepare Grandma Maud’s Red Beans and Rice meal per directions on package. 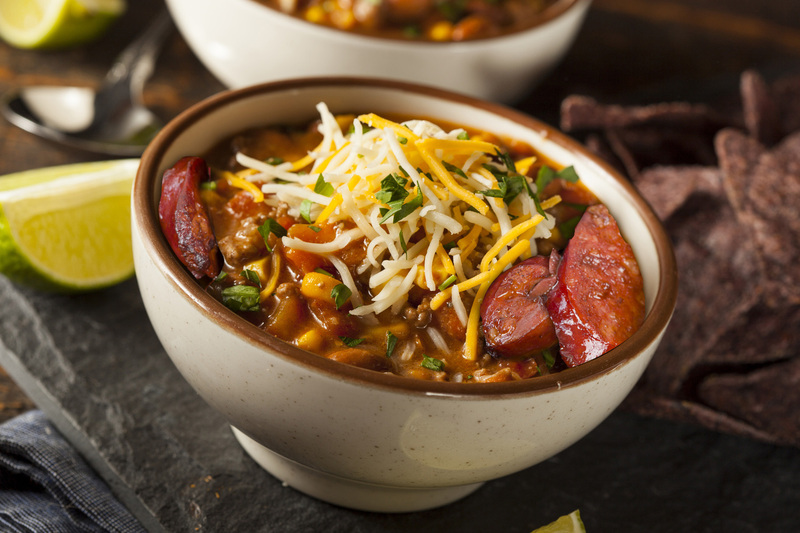 Cut up ½ pound of sausage ( or 3 links ) into bite-sized pieces and brown in skillet or microwave. Add sausage and cheese to hot mixture of Red Beans and Rice. Cook for an additional five minutes, stir and serve. A tailgaters dream! Prepare Grandma Maud's Red Bean and Rice Meals at home, pack in thermos and top grilled sausages on game day. You do not have to tell anyone how easy it was either! Prepare Grandma Maud’s Down Home Cookin’ Red Beans & Rice Bean Meal per directions on package. 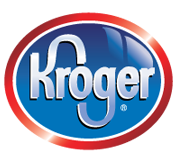 While beans are cooking split sausage lengthwise and brown on a stove top grill or outdoor grill. 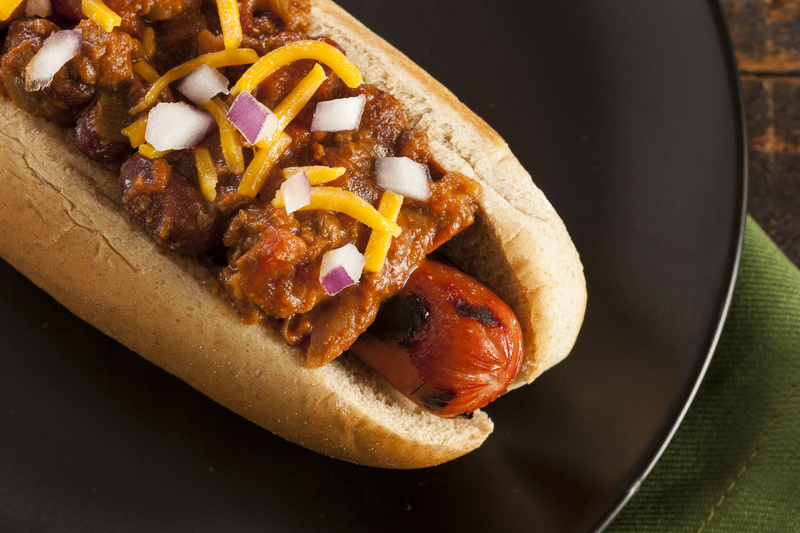 Place sausage open on bun and fill with red beans and rice. For added extras top with diced red onions and cheddar cheese. 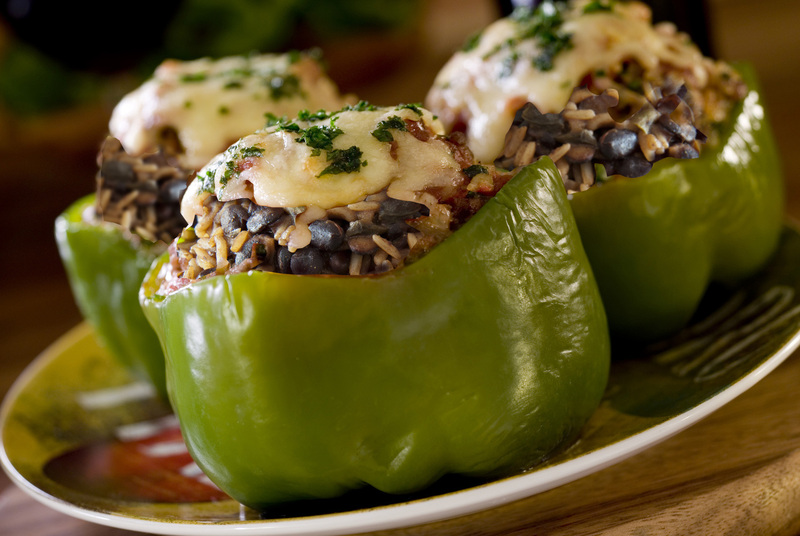 Enjoy these delicious stuffed peppers as a vegetarian option or add smoked sausage to the mix for a hearty meal. Preheat oven to 350°.Cut off tops of peppers and remove seeds. Over High heat lightly sauté onions, garlic, and tomatoes. Add water, bring to boil and add Grandma Maud’s Black Beans & Rice. Boil 15 minutes, stirring occasionally. 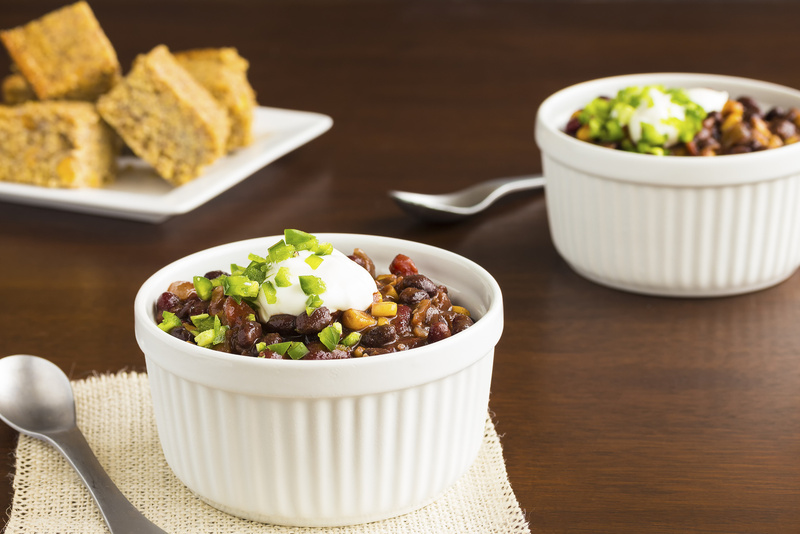 Reduce heat, stirring frequently, simmer 15 minutes or until beans are tender. These simple and incredible stuffed tomatoes are perfect as a side or on top of a bed of lettuce for a unique salad. Preheat oven to 350°.Cut off tops of tomatoes and remove seeds. Lightly sauté garlic and mushrooms. Add water, bring to boil and add Grandma Maud’s Black Eyed Peas. Boil 15 minutes, stirring occasionally. Reduce heat, stirring frequently, simmer 15 minutes or until peas are tender. Add rice and cover for 5 minutes. 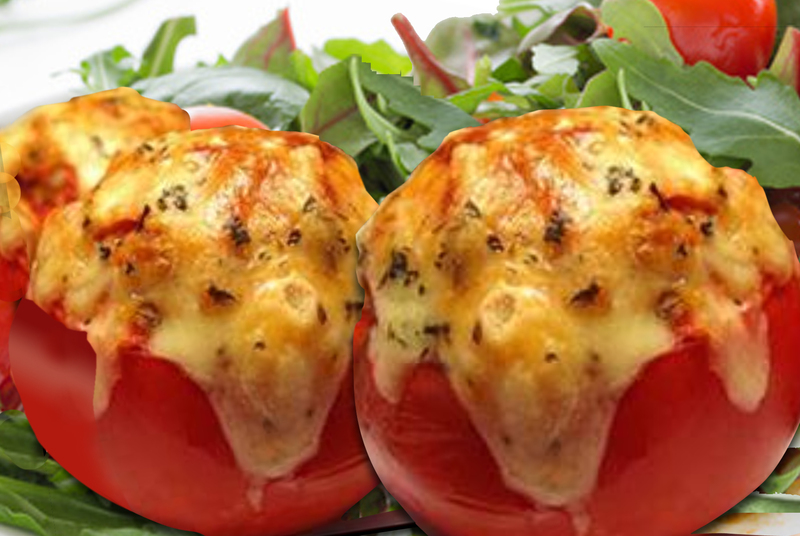 Fill tomatoes, bake for 20 minutes, top with cheese and bake until melted. Add Grandma Maud’s Down Home Cookin’ Black Beans & Rice to water and cook for fifteen minutes. Add tomato and cook an additional fifteen minutes. While the beans are cooking, brown the turkey and drain. Sprinkle with brown sugar and mix. Combine the meat and beans. Garnish with French Onion Dip in the center of each bowl. Can add 1/2 cup frozen corn to the last 5 minutes while beans and tomatoes cook. Garnish with cilantro and avocado.